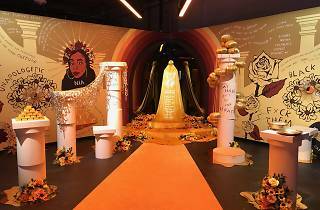 We can give you a lengthy list of reasons to visit Refinery29’s fourth annual 29Rooms, but the only one that matters is this: Go to be inspired. It's more than just a selfie palace (though there are many opportunities to take photos). In our opinion, shelling out $40 for the perfect profile picture shouldn't be your main motive to attend. The biggest draw is not the opportunity to experience, but to create culturally-relevant art. Through interactive rooms offering on-site drawing, crafting and artist tutorials, you can let your imagination wander as if you were a kid again. To break down this year's event, we'll start with the obvious: There are 29 activations (they're not all necessarily "rooms") ranging from extremely hands-on spaces to more reflective and thought-provoking ones. There's no right or wrong way to explore the playhouse. As R29 puts it: The space is meant to be "like speed dating for ideas and art." Some of the installations are even meant to be phone-free. R29's Co-Founder and Creative Director Piera Gelardi says, "We haven't noted which rooms are not intended for phones. Of course, it’s a judgement-free space. But we want people to be present, live in the moment and to reconnect with themselves." 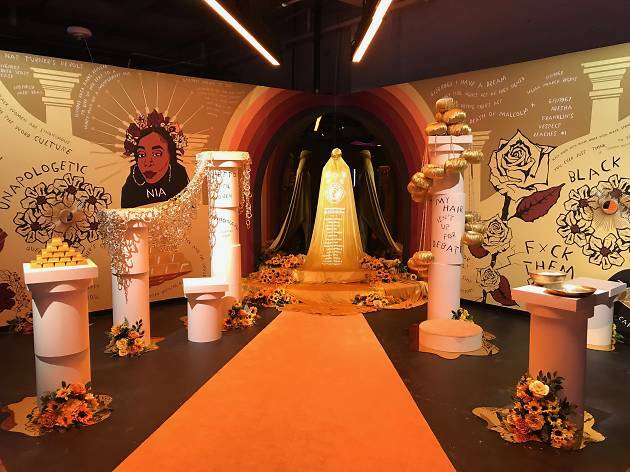 You may find yourself forgetting to pull out your phone entirely when you're so busy having a blast in rooms like "Inner Beauty Ball," co-created by Bushwick entertainment hub House of Yes. It's a nightclub filled with drag queens and performers where visitors can get glitter makeup applied while they wait to enter the bumpin' disco dance party. Other rooms are more educational, like "Know! Your! Rights! "—a '70s-inspired game show created in conjunction with ACLU to help guests learn about their civic rights. “Our intention for 29Rooms has always been that it’s a place to ignite creativity, spark dialogue and inspire people to dream bigger. That’s our north star,” says Gelardi. Go on and chase the stardust, New York! Without giving too much away, take a peek at some of the rooms below. 29Rooms is located in Boerum Hill, Brooklyn at 588 Baltic Street. The dates are Thursday, September 6–Sunday, September 9 and Thursday, September 13–Sunday, September 16. The experience is open from 11am to 10pm each day. Get your tickets here.